SALE ON DAGGER WEAPON SETS! Get dagger weapons today on Ebay! VISIT EBAY for listing of single and double Dagger Weapon sets! Become a member of the Dagger Fencing Association today for FREE! To join in discussion groups, download dagger fencing pictures or post dager fencing events click HERE. As a member you get the latest updates on weapon & equipment discounts plus access to the official Dagger Wear store where you can purchase T-shirts, DFA hats and other cool stuff! Two weapon electric sport fencing has finally arrived! This new and exciting sport is ideal for experienced fencers who seek the intensity and thrill of actual two-weapon sword combat utilizing standard epee style fencing equipment. This Olympic style fencing sport incorporates a secondary weapon (dagger) used in tandem with the epee to represent the classical style of two handed fencing popular in the late Middle Ages and early Renaissance. This sport is often a game of provocation, with each player trying to parry with one weapon and attack with the other. A point is scored by depressing the tip of either blade against any part of the opponent. Fencers can receive a point from either weapon and there is a possibility of both weapons being activated simultaneously. Competitors wear standard protective fencing equipment consisting of jackets, knickers, gloves, masks, and hard plastic chest protection. The "Y" style body cord is worn under the jacket and connects both weapons to the scoring apparatus. The flexible dagger is manufactured in one optimal blade length and available in left or right hand. Olympic Dagger Fencing is performed on a standard length fencing strip and tethered scoring equipment. The rules and scoring are basically the same as standard épée fencing only there is the addition of the dagger weapon in the opposing hand. This sport differs from Olympic Dagger Fencing in several ways. Wireless fencing utilizes a 20’ x 20’ square or round piste and wireless scoring technology. Fencers can move in any direction around the piste to score a point. This type of fencing technique reflects tactics that were often used in actual sword combat. Will Dagger Fencing become an Olympic Sport? The Dagger Fencing Committee is promoting this fun, safe sport to some day be a part of the Olympic Games. What is the Dagger Fencing Association? The Dagger Fencing Association (DFA) was created specifically to promote a new combat sport that reflects main gauche and rapier style blade work of the early Renaissance. Much of the FIE & USFA rules were integrated into this sport so individuals versed in Olympic Fencing will easily adapt, providing they have sufficient ambidextrous skill to master the centuries old techniques. The main difference between Olympic épée fencing and Dagger Fencing is the elimination of tethered scoring equipment to allow unlimited footwork in a round or square piste. What does a Dagger weapon look like? The Dagger Weapon is 66 cm in length from tip to pommel and features a flexible blade with a saber guard, 3 prong standard épée plug, rubber saber handle, felt pad and épée style tip. The guard is connected to the blade with a standard saber metal pommel. 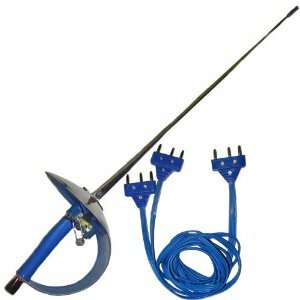 The one-of-a-kind Y-style electric body cord is compatible with standard épée weapons and scoring equipment. One end connects to the dagger, one end connects to the épée and the "Y" plug connects to the scoring device. The dagger weapon was engineered by the product development company INVETON LLC to create a light weight, flexible weapon with similiar characteristics of Olympic style fencing equipment. Where do I get an official Dagger Fencing weapon? Contact us for all your dagger fencing equipment needs! Don't forget to check out our PRODUCTS page for more great official DFA products! Yes, this new sport is ideal for experienced épée fencers who seek the intensity and thrill of actual two-weapon sword combat. The easiest way to get started in dagger fencing is to follow Olympic Épée rules at your local salle while using the new dagger weapon on a standard strip in tandem with your existing épée. For the official rules and regulations that involve a square or round piste while utilizing wireless scoring equipment download a FREE copy of the official DFA 2012 rulebook found on the RESOURCES page. In addition to the weapons, is there anything special I need to Dagger Fence? To ensure safety and protection while dagger fencing in a round or square piste, a back zipper jacket is required. While fencing on a standard strip a standard regulation fencing jacket is acceptable. A full body plasteron and fencing glove for each hand is mandatory. If you don’t have a full body plasteron, you can wear a left and right hand plasteron together. DAGGER TEE's and other DFA gear! Wether you're training or just playing a few dagger bouts you'll appreciate the technologically advanced moisture wicking power of our new 100% polyester textured CoolDry fabric. It disperses moisture quicker, dries faster, and resists wrinkling better than most fabrics and has a lightweight silky feel that is a joy to wear. Quality tailored from top to bottom, this handsome tee features a double-needle reinforced crew neck, inner neck tape, double-needle hemmed sleeves and bottom hem, and a classic cut. As an added bonus, we've even eliminated the neck tag. Various sizes available in MENS, WOMENS & CHILDREN! As the official representative organization of Dagger Fencing, the combined principles of ethics, moral standards and sporting loyalty are the main values which set forth the legitimate activity to this new and exciting contact sport worldwide. Through the concerted action of all its members the DFA, commonly known as the Dagger Fencing Association, the DFA will act within the framework of our fundamental principles set forth by the Dagger Fencing Committee (DFC) for the sole purpose of maintaining integrity and strengthening autonomy within the sport for the professional and amateur enthusiast. In agreement with other fencing organizations the same principles will be integrated in order to create and promote the sport and the issues directly related to fencers. The DFA, in cooperation with any organization related to the sport of fencing in those countries where this activity is fully supported for Olympic and professional events will support said organizations to achieve common goals for Dagger Fencing on a global basis. Congratulations to Colin Miner who came in 1st place in the Dagger Fencing Event. We would like to thank everyone who participated! Check out ASKFRED.com for the next dagger fencing event! Check out Dagger Fencing in Japan! Counterfeit Equipment Being sold on fencing websites! Is Physical Chess the only supplier?